Pase su tiempo en el puerto de Burdeos visitando el pueblo histórico y pintoresco de Saint Emilion en una excursión a la orilla de medio día. Explore las estrechas callejuelas de este sitio declarado Patrimonio de la Humanidad por la UNESCO, explore galerías y estudios de artistas o visite la iglesia subterránea. También tendrá tiempo libre para probar algunos de los famosos vinos durante una cata de vinos. El tamaño del grupo está limitado a ocho personas para garantizar la atención personalizada de su guía. Tiempo libre para explorar o disfrutar de una cata de vinos. Tour en grupos pequeños limitado a ocho personas, lo que garantiza la atención personalizada de su guía. Desembarque de su barco en el puerto de Burdeos y conozca a su guía para realizar una fascinante excursión a la ciudad de Saint Emilion, declarada Patrimonio de la Humanidad por la UNESCO. El hermoso pueblo es precioso para pasear y una parte central de la famosa industria vitivinícola de la región. De hecho, lleva el nombre de un monje del siglo VIII cuyos seguidores fueron los primeros en cultivar uvas en esta área para hacer vino. Hoy en día, está rodeado por algunos de los viñedos más famosos del mundo. Sigue a tu guía en un recorrido a pie de 45 minutos por Saint Emilion, después de lo cual tendrás tiempo para explorar la ciudad a tu aire. Almuerce (por cuenta propia), explore las galerías de arte y las boutiques, visite la iglesia subterránea excavada en la piedra caliza o participe en una cata de vinos (hay muchas bodegas ubicadas en Saint Emilion) antes de regresar a Burdeos y tu nave. 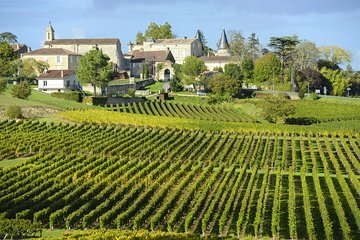 We enjoyed a private shore excursion of Bordeaux and Saint Emilion, two of the prettiest towns in the area, after we arrived at the Bordeaux port. We explored the historic city of Bordeaux with our private guide, Karim, who was excellent. Following this we made a trip to the charming town of Saint Emilion. Both towns are UNESCO World Heritage Sites. Then we stopped at a chateau for a wine tasting of some of the regions famous vintages. Group size was only the three in our party. We booked this tour through Viator. Our party of 12 signed up for 2 vans for this tour. Our friends in the other van were very happy with their guide. Unfortunately our guide had not much information to share with us. When we asked her if we could visit the underground monuments she replied that we should have booked that in advance and it was not possible to take us there anymore. Later on we found out that our friends in the other van were accommodated by their guide and got to enter the site. We were also led by our guide to walk a steep, slippery cobbled path to the road below where she took us to a wine store for wine-tasting. She left us there and went to pick up her car which she parked around the corner from the shop. Why she made us negotiate the steep incline (4 of us were seniors) instead of dropping us off from the start is beyond my comprehension. She told us to take as long as we needed at the wine store, after which she said it was time to drive us back to the ship. It seemed she was only interested in taking us to buy wine (probably had commission) instead of showing us the place and sharing information as tour guides are paid to do. We got back to our cruise ship about an hour earlier than our friends in the other van, whose guide took her time to show them the sights. Needless to say, all 6 of us were terribly disappointed with this tour.